It's my boyfriend's sister's birthday party today, and to keep things short: i needed a snack/dessert to replace the birthday cake that i wouldn't be eating. 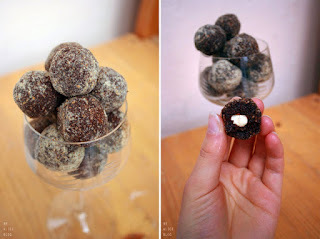 And a few days ago i stumbled across the 3-ingredient "Ferrero Raffaello" balls by Agnieszka @biegiemdolodowki on instagram that sounded sooo genius and incredibly healthy - i just had to try them as soon as possible! 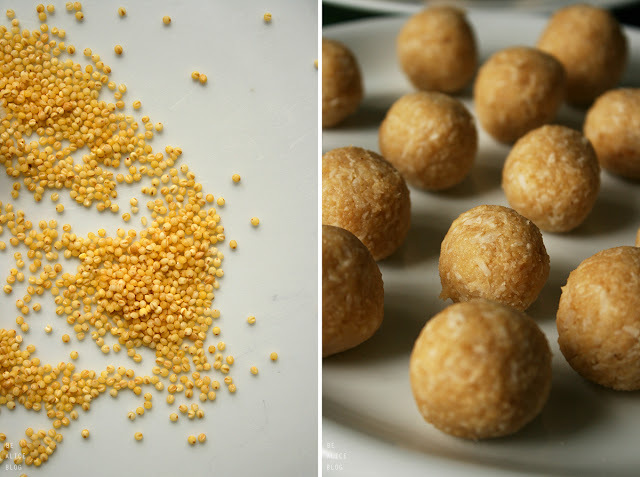 Sooo, did you ever think of making raffaello balls with MILLET?! 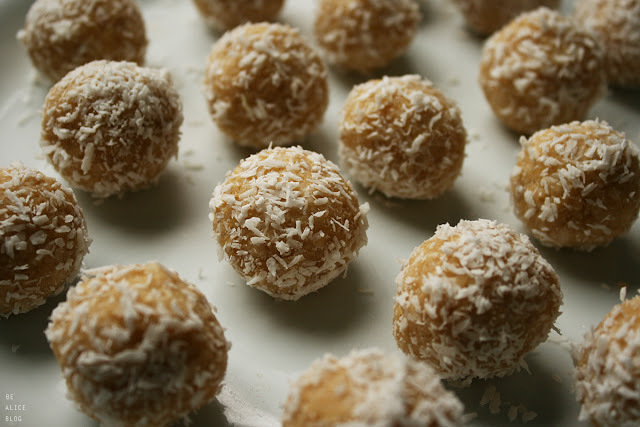 Raffaello is a coconut-almond confection filled with a white milk cream and white blanched almonds. 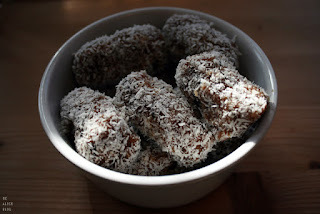 I love coconut, so i was excited to try a healthyfied version of one of my favourite snacks back then. 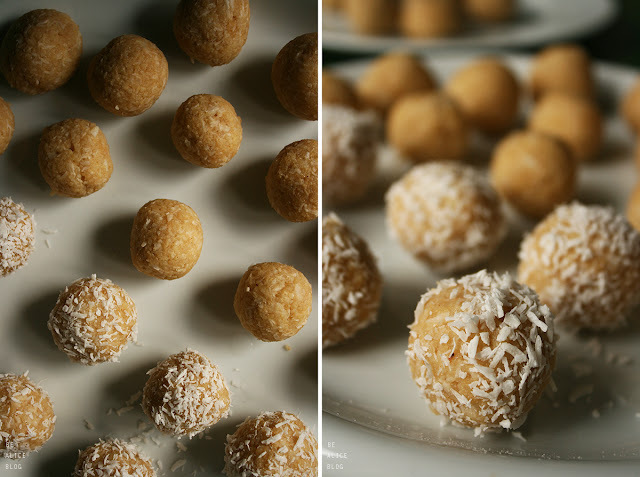 It's probably the healthiest version of raffaello (copycat) recipes out there - no chocolate, no coconut cream, no condensed milk, no powdered sugar - and it's also the cheapest version i think as it doesn't require any cashews, coconut oil, cacao butter or anything of that sort! Millet is not only very delicious and inexpensive, it's also very nutritious, packed with protein, B vitamins, as well as vitamin C and beta-carotene, minerals and trace elements. It's basically a "superfood". Just 100g of millet can cover the daily iron requirement. Therefore it is best to combine millet with fruits or vegetables rich in vitamin C to enhance iron absorption. Cook millet according to instructions (basically, bring the water to a boil, add the millet and cook with a little bit of salt). Transfer the cooked millet into a mixing bowl and combine with shredded coconuts and maple syrup (or any other of the listed sweeteners), - the best way to mix them is to use your hands. This is where we can play. Just add as much as you think is right - just try in-between to check if the "dough" is sweet and coconutty enough. 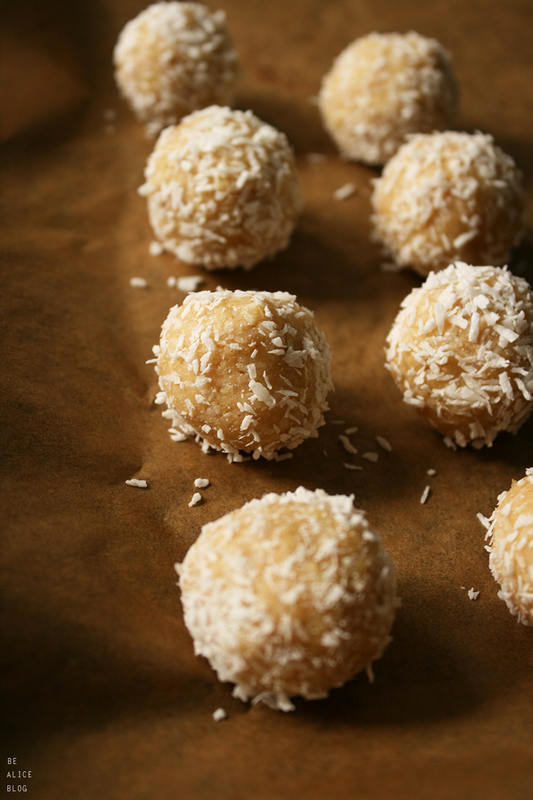 If the mixture is too sticky and you cannot easily form balls just add more coconut flakes. If it's too dry, add more syrup! 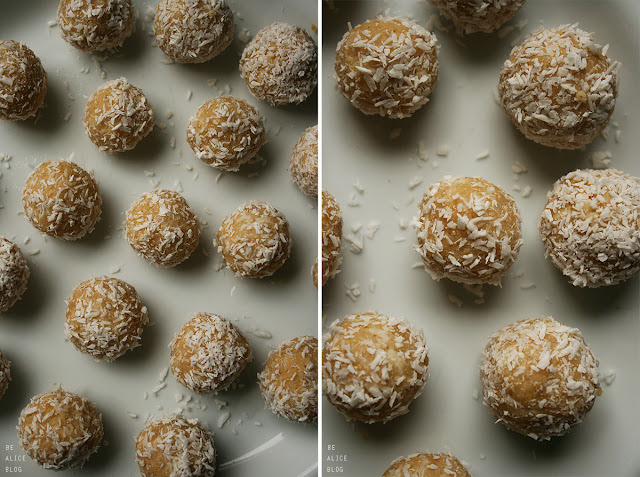 Take approximately one teaspoon of the dough mixture, place one almond in the middle and shape into small balls (the size of Raffaello candies). 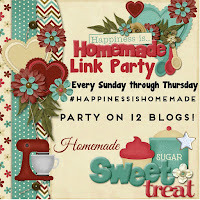 You can also use an ice cream scoop to shape the balls! Roll each ball in shredded coconut. 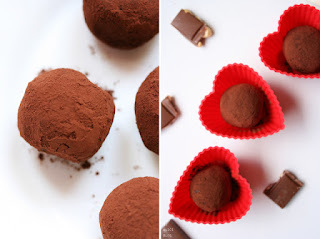 Instead of the almond, you could place a piece of vegan white chocolate inside each truffle! Add a teaspoon of almond butter to the mixture. Another idea that i got while taste-testing my raffaello truffles was to make them with (coconut) rice pudding instead of millet next time to get completely white truffles! I have no idea if that would work better or work at all - but i'll try for sure!